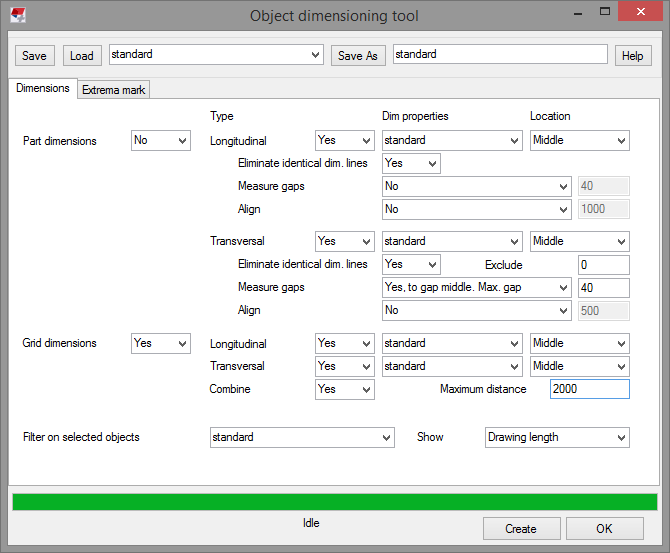 With this tool, you can create dimensioning of erection drawings fast. 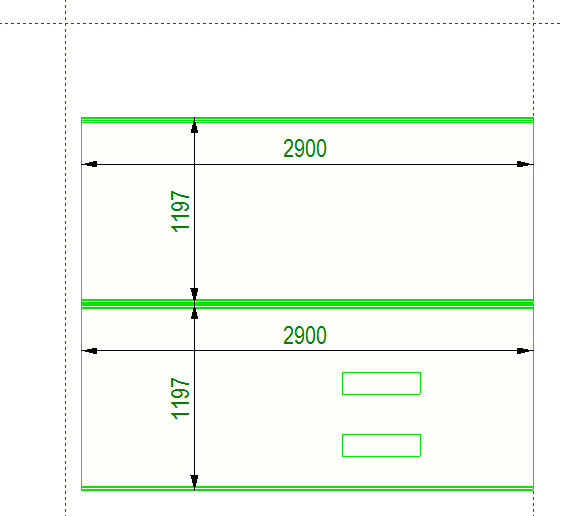 It adds overall dimensions in both directions, creates an extrema mark and line with object information and adds locations from grids. 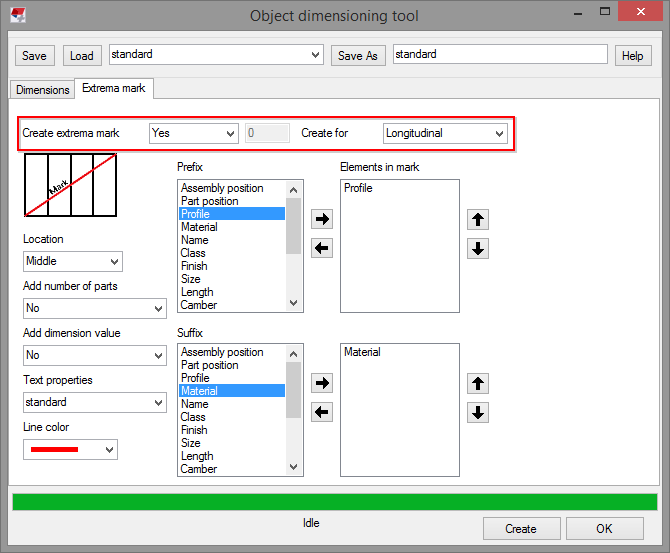 Creates dimensioning in both directions, position from grid and extrema mark. Creates longitudinal and transversal part dimensions. You can decide if you want one or the other or both. You can set dimension properties. You can eliminate identical dimension lines. No - does not measure gaps. Yes, to gap middle. Max. gap - measure part to the middle of the gap. You can also specify the maximal size of the gap. Yes, to part ends. Max. gap - measure part from border to border, but creates another dimension for the gap. You can also specify the maximal size of the gap. No - does not align or combines. No and combine if possible - does not align, but tries to combine identical dimensions into one. The lines must touch to be able to combine. Yes. If distance ≤ - Aligns if the distance is less than what you choose. But does not combine. Yes and combine. If distance ≤ - Aligns and combines identical dimensions into one. 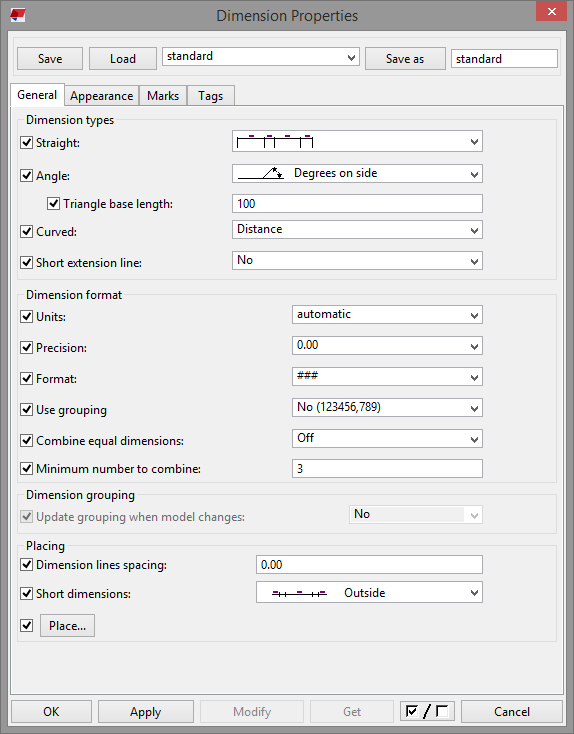 Creates longitudinal and transversal grid dimensions that show the distance to the grid. You can decide if you want one or the other or both. You can set dimension properties. 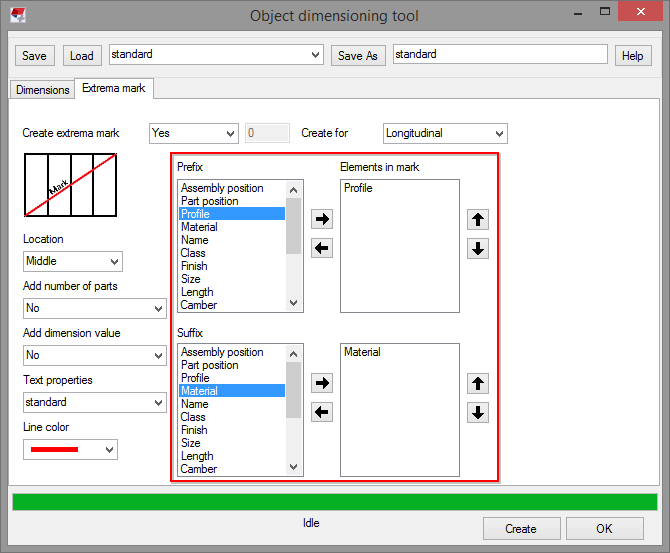 You can eliminate identical dimension lines by choosing the combine settings. You can set maximal distance for which the dimensions will create. 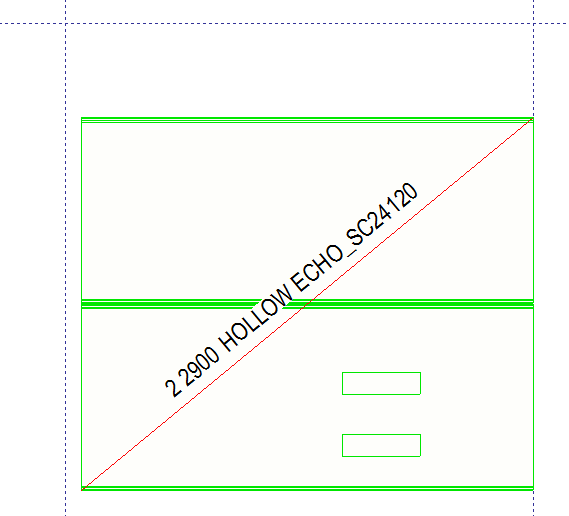 Dimensions = Filter on slected objects. You can filter selected objects based on the filter you have selected. 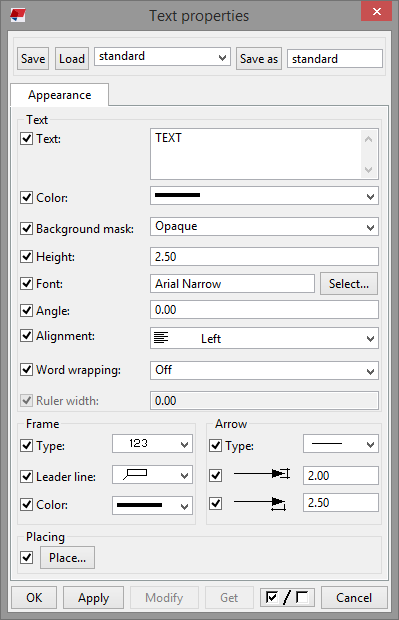 Also, you can decide if you want to show drawing length or real length. 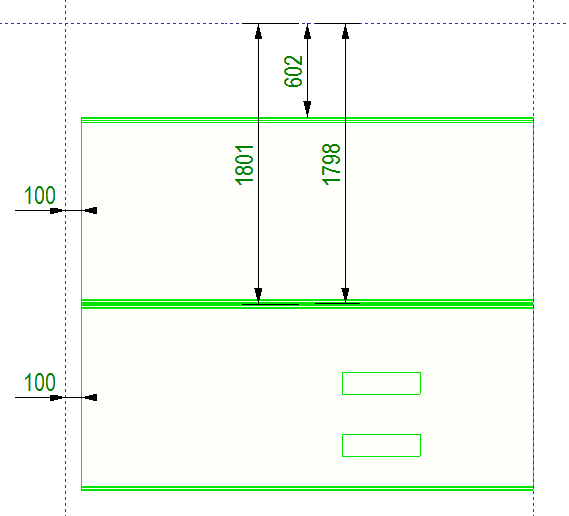 Drawing length - shows the length of the part in the drawing, but if the part is skewed the length might be little off. Real length - shows the real length of the part, even if it's skewed. You can set your own dimension property. 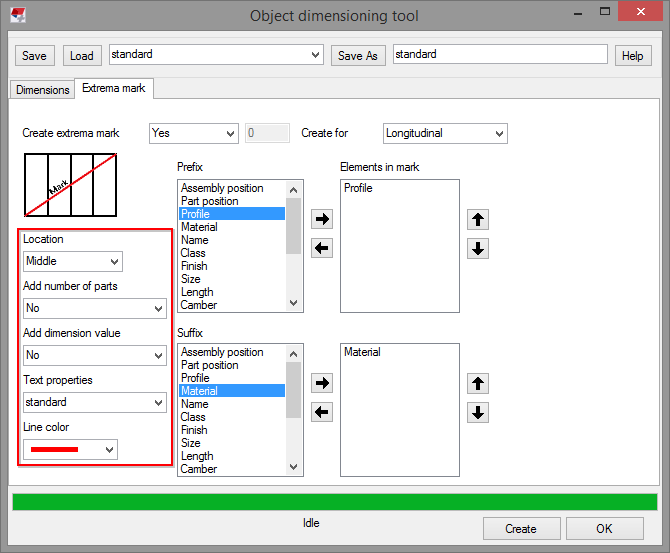 Create extrema mark has three options. Either don´t create, create or create if the number of selected parts is bigger than the number you have chosen. Also, you can create for longitudinal, transversal or both. You can add elements to the mark as prefix or suffix. You can add the number of parts before or after the prefix. You can add dimensions value before or after the prefix. You can set text properties. Or you can choose line color. Extrema mark = Text properties. You can define your own text properties.